Aside from their quality products, one of the best things about Waterpik is that they continue to innovate. Year after year, they surprise the market with something different. Case in point: the Waterpik Sidekick. It has its limitations, but who would have thought of developing an ultra-compact, collapsible water flosser? Only Waterpik for sure. Now, there’s the WF-05, a device that promises to whiten your teeth just by flossing with water. Usually, teeth whitening is done either by applying strips, zapping your plaque with laser, brushing with a homemade remedy, or combining these methods. With the WF-05, you’re given another option. But does it work? Let’s find out in this Waterpik whitening professional water flosser review. At first glance, the Waterpik WF-05 looks like an ordinary water flosser. You can even mistake it for an Aquarius (WP-663). But what sets it apart is a feature called Whitening Infuser technology. The handle is especially designed for this purpose. It has a compartment for whitening tablets, which when mixed with water, help remove stains and plaque even in hard-to-reach areas. For your reference, see the image on the right. That said, expect the following from your package: the water flosser itself, 30 whitening tablets, 2 classic jet tips, 1 orthodontic tip, 1 plaque seeker, and a tip storage case. 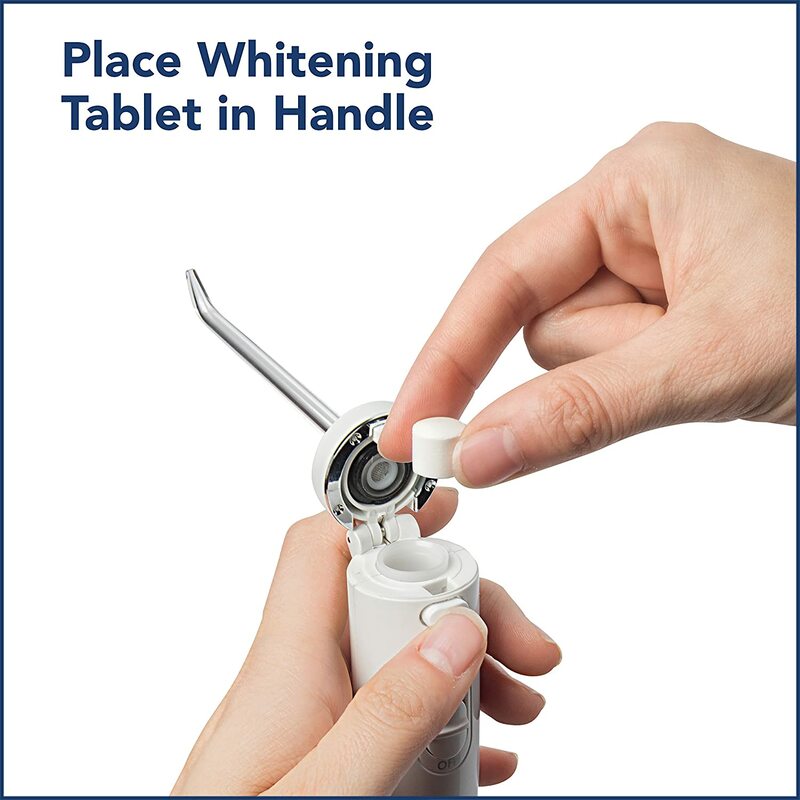 Waterpik recommends that you use one whitening tablet per day. The active ingredient in these tablets is sodium laurel sulfate. As advertised, you can restore your teeth’s natural whiteness in just 4 weeks. 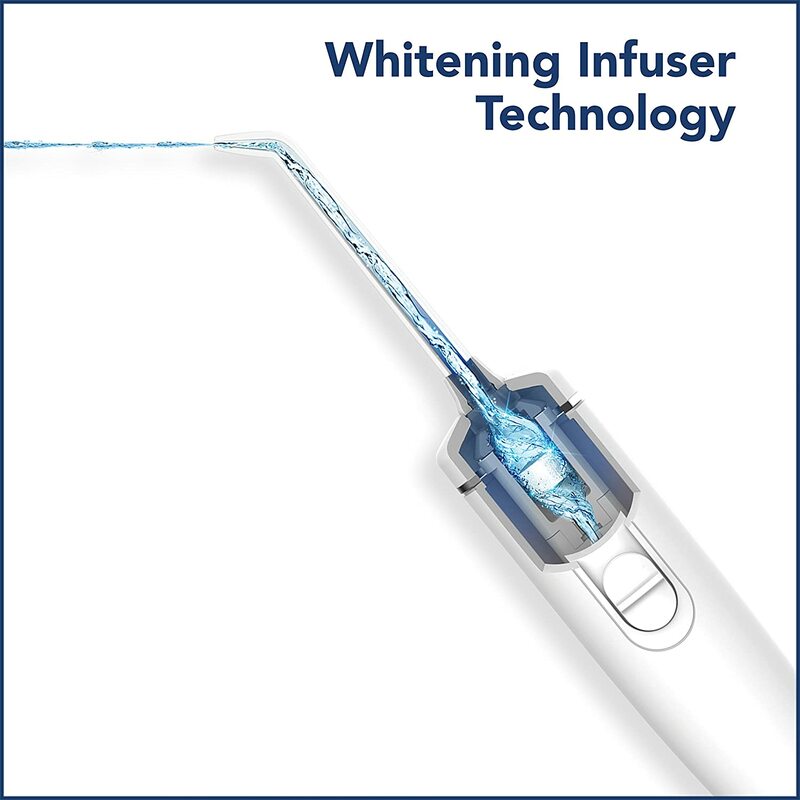 In this part of our Waterpik whitening professional water flosser review, we give you a summary of what previous buyers said about their unit. – Whitening. Does the Waterpik WF-05 really whiten teeth? Not everyone agrees, but the general feedback has been positive. Your teeth may not be “back to their original whiteness,” but there should be an improvement after 4 weeks. They should at least look lighter. – Performance. As expected, when it comes to dislodging small food particles trapped between your teeth and gums, the Waterpik WF-05 performs fairly well just like the other Waterpik water flossers. For first-time users, this is a nice and memorable experience, much more pleasant than using a string floss or brushing alone. – Whitening Tablets. One of the most common questions is “Does the tablets work with other models of Waterpik flossers?” Unfortunately, the answer is NO. These tablets are designed to work only with the special handle of the WF-05. Putting them in the reservoir won’t cut it. – Limitation. This product is for use only within the US and Canada. As clearly mentioned by Waterpik’s product support, you can use a convertor, but this will damage the product. Also Read: Waterpik WP-100 vs WP-300: What’s the Difference? 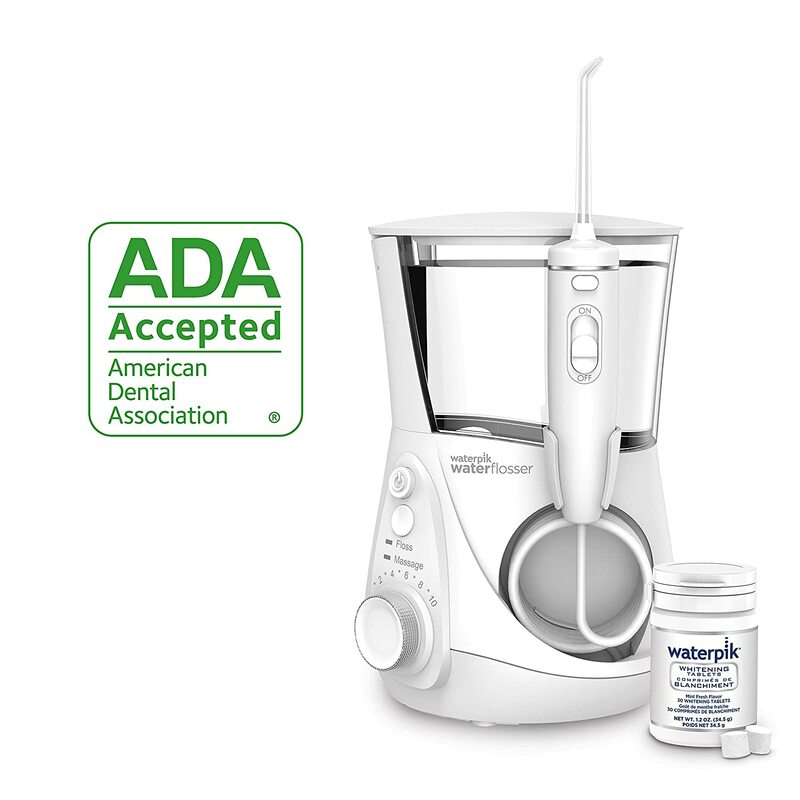 Based on overall feedback, the Waterpik whitening professional water flosser (WF-05) helps brighten your teeth. As a flossing device, it effectively dislodges food particles and nicely massages your gums giving you a pleasant experience everytime. A drawback is that this is not for global use. One person says it doesn’t work in Saudi Arabia. This is consistent with what Waterpik product support says. This product works within the US and Canada only.